An Entrepreneur Network panel discusses fundraising at IAC, hosted by Greg Blatt ’90. Summer was well underway when a group of tech-savvy Colgate alumni and students gathered at Airbnb. 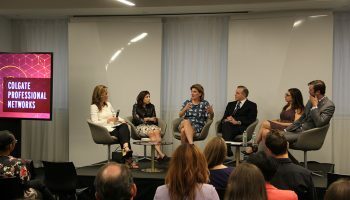 The event was hosted by Airbnb’s Public Affairs Manager Christopher Nulty ’09 and the Colgate Digital Media and Technology Professional Network. 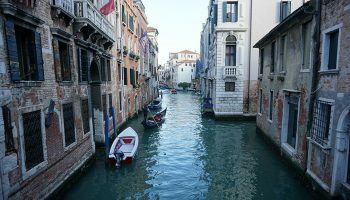 Participants were there to meet, greet, and do some networking, but something else was going on — something as different as the environment in which they had convened. You know you’re at Airbnb when you walk through the door, because their offices look like apartments offered for rent around the world via their website. In a similar fashion, you know when you’re attending a Colgate Professional Networks event. Colgate’s alumni office and career services staffs have carefully shaped associations within the university community that are based on common career aspirations rather than traditional demographics and geography favored by peers at other schools. 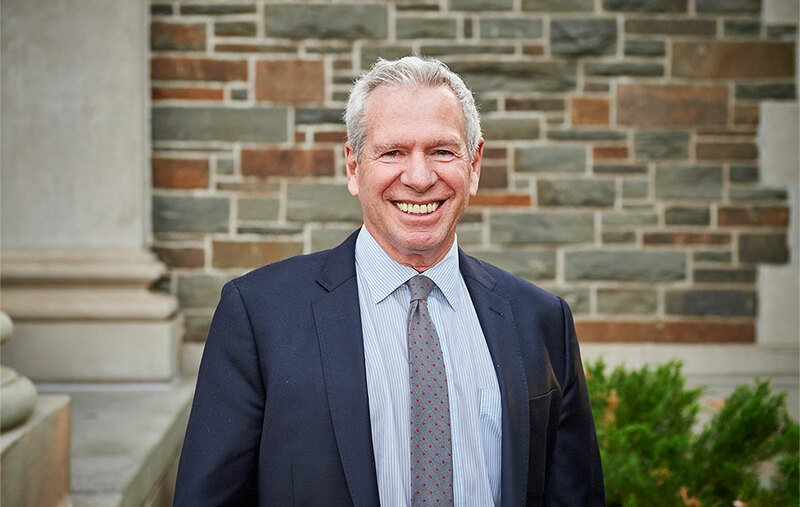 Networks currently include common good, finance and banking, the Colgate Real Estate Council, health and wellness, entrepreneur, digital media and technology, and the Colgate Lawyers Association. Students attend a CREC-sponsored immersion trip to New York City. 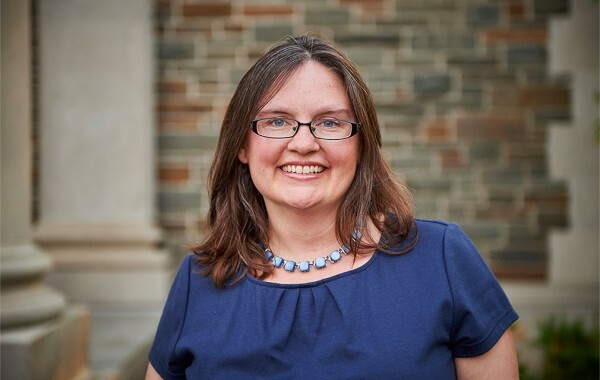 “We wanted alumni to see professional networks as gifts from Colgate to them — a unique opportunity to connect and learn,” said Jennifer Stone, who directs the program. The networks serve as an on-ramp for students seeking post-graduation employment in a challenging economy; strengthen ties between alumni; demonstrate the crucial role that alumni play in society; and provide a chance for alumni to give back to the university that prepared them for success. “The outcomes in such a short period of time have been remarkable,” Stone said. 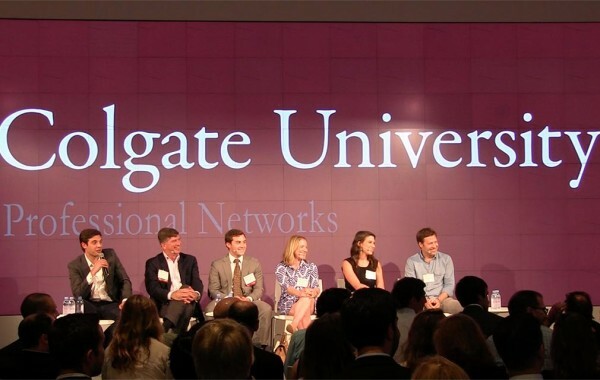 “Students have landed jobs and internships; alumni have made business deals and contacts.” Last year alone, more than 158 alumni connected with the Colgate community for the first time in years, thanks to the initiative. 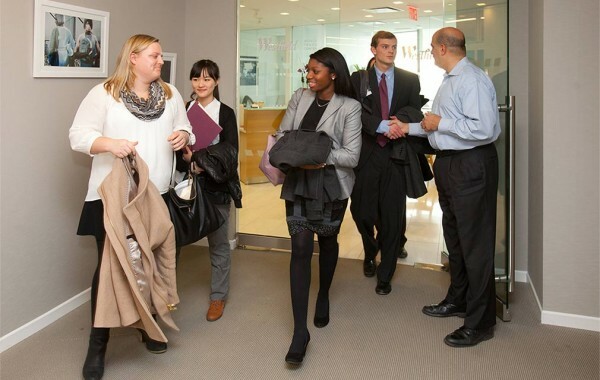 There is a significant, individual impact every time a professional network hosts an alumni networking event, a panel conversation, or a boot-camp training session on campus with students. The list of names and the catalogue of faces have grown too long for a full review. Instead, here are two examples of the power of these efforts. During commencement on May 17, Anna Gilman ’15 went from Gamma Phi Beta sister, figure skater, campus lifeguard, tour guide, and peer health educator to a Memorial Sloan Kettering Cancer Center (MSKCC) session assistant. 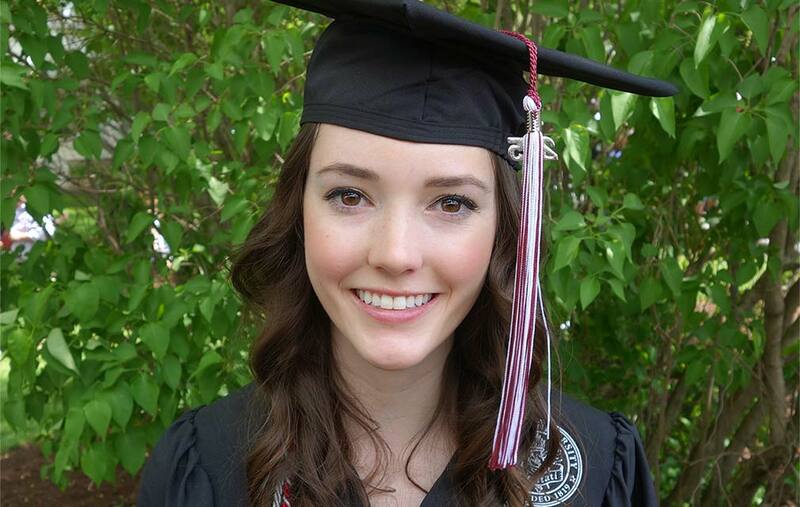 She earned the job through long hours of hard work at school — and connections she made through Colgate’s Health and Wellness Professional Network. Gilman’s path to full employment stretches back to early spring of her senior year. 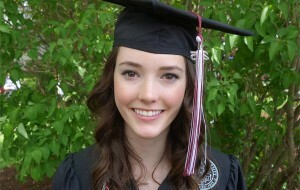 She had entered Colgate as a pre-medical student but quickly switched to psychology. She knew from her volunteer work at Huntington Memorial Hospital back home in Pasadena, Calif., that she wanted to work with patients. But she was unsure how she could do that if she wasn’t going to be a doctor. 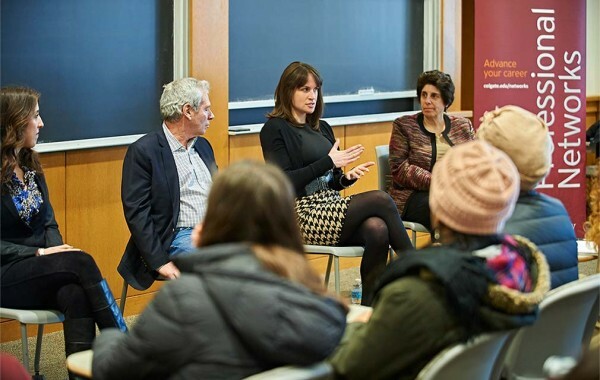 Last March, the Center for Career Services teamed up with the Shaw Wellness Institute and the Health and Wellness Network to bring a panel of alumni to campus to discuss alternative careers in the wellness field. 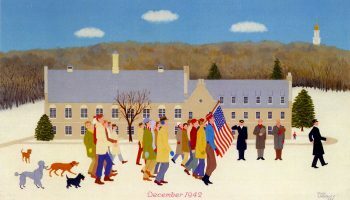 This was an important moment for those who weren’t interested in becoming physicians or dentists, and it opened Gilman’s eyes to new possibilities. She was inspired by alumni like Rachel Stahl ’11, a clinical dietitian at New York-Presbyterian Hospital, and began to think in earnest about becoming a dietitian. But the Colgate network wasn’t done with her yet. The Health and Wellness Network discusses alternatives to medical school. Because she was a peer health educator, Gilman received an invitation to travel to New York City in April for a Health and Wellness Professional Network event. In his comments that evening, North Shore-LIJ Health System’s Jon Sendach ’98 stressed the importance of hiring Colgate students and alumni, because they make such solid employees. Gilman met Mallory Rowley ’14, an MSKCC session assistant, at the event. They talked about Gilman’s plans for the future and her job search. Based on her own knowledge and experience, Rowley had a suggestion. Why not apply for an open position at MSKCC? Gilman could use the time to build her résumé, make contacts, and develop an understanding of exactly what it’s like to work at one of the world’s top medical facilities. It was a daunting proposition, given the number of applications that MSKCC receives, but a personal introduction to the hiring manager could cut the response time from three months to less than three weeks. Gilman jumped at the opportunity. She filled out the online application, took an aptitude test, and submitted her résumé by mail. Within two weeks, she received an invitation to the interview that would, ultimately, lead to a job offer. When Gilman reports to work at the MSKCC Ambulatory Care Center this August, she’ll serve as a liaison between patients and doctors, a role that she will relish. “I have a genuine interest in helping people, and as a specialist, I’m going to be able to give them care and reassurance that they’ll need during cancer treatment and recovery,” she said. When she was in sixth grade, Kelechi Oguh ’08 decided she wanted to work in real estate. 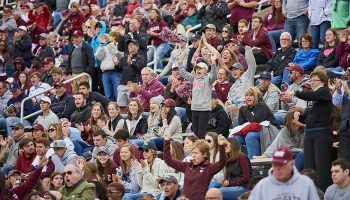 She spent the next four years in that training ground before a visit to the Colgate alumni website changed the course of her future. 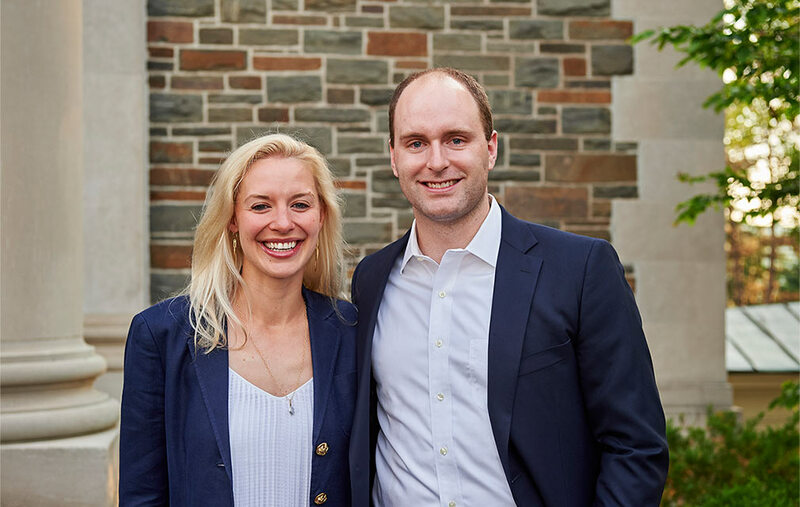 She noticed that the university was just launching a new professional network, the Colgate Real Estate Council (CREC), chaired by James Nelson ’98. Alumni in the industry, and those who were merely interested, would be attending an inaugural event across the street from her office. “I walked into the room,” she said, “thinking my goal is to get a job or at least get an interview, informational or otherwise, that could lead me to a career transition.” The first person she met was Presidents’ Club Chair Kevin Danehy ’83, who proceeded to introduce her to friends like Brian Collins ’82, Paul Massey ’82, and many others. This crew of new mentors helped Oguh to decide exactly what kind of real estate work she wanted to pursue. “Paul Massey told me that it’s OK if you don’t know what you want to do, especially at a young age,” she said. “But his advice was to meet 100 people. By the time you’ve done 100 informational interviews, you’ll have an idea.” It only took 30 before she knew that she wanted to go into office leasing at CBRE Commercial Real Estate Services. 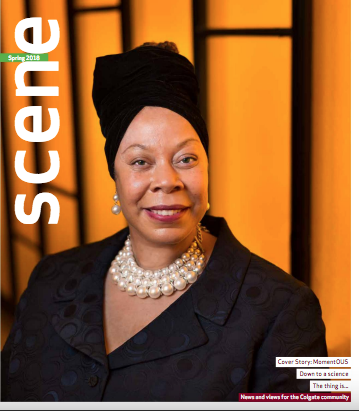 Working her CREC connections, Oguh was employed at CBRE within six months of attending her first network event. She began in research, inputting data so that she could learn the market, and only weeks later, she was thrown into sales — in the industry she had been planning to enter since sixth grade. From Chicago to Dallas to Denver, Colgate’s professional networks deliver unique opportunities for alumni and students in all career paths because they tap into personality traits found in so many community members. 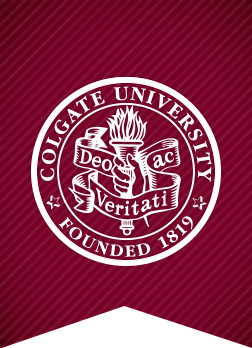 Colgate people set big goals, and then they work passionately and collaboratively to achieve them. And, as Kelechi Oguh discovered, it’s the back-and-forth nature of Colgate-style career development that pays such rich dividends to all involved. This fall, Colgate will launch three new professional networks for community members: STEM, communications, and consulting. Want to get involved? E-mail Jennifer Stone at professional networks@colgate.edu and visit colgate.edu/networks. The nominations committee of the Alumni Council seeks recommendations for this 55-member volunteer board. Each year, 11 to 13 positions are filled. For a full list of qualifications, visit colgate.edu/acnominations. The awards committee also seeks nominations from the classes ending in 1 and 6 for awards to be presented at Reunion 2016. 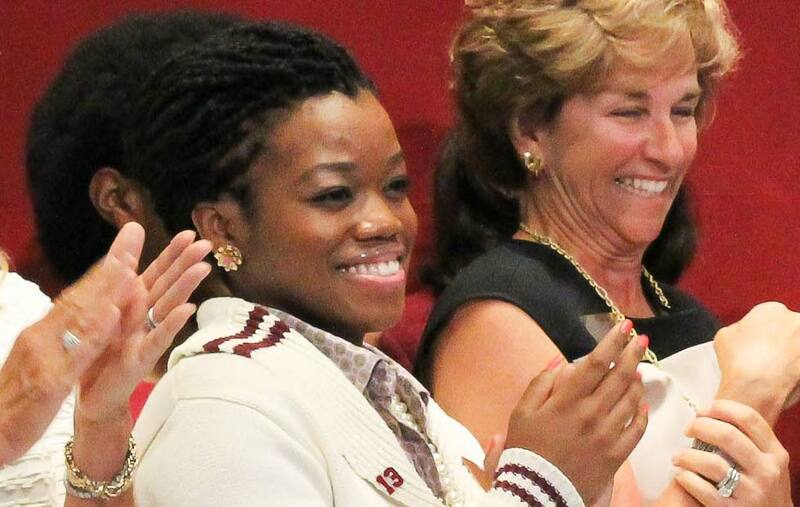 A full list of categories can be found at colgate.edu/alumni-awards. Send nominations by Sept. 1, 2015, to: Tim Mansfield, executive secretary, Colgate University, 13 Oak Drive, Hamilton, NY 13346. For guidelines and more information, visit colgate.edu/alumnicouncil. At Reunion 2015, the Wm. Brian Little ’64 Award for Distinguished Service was presented to (L to R): James A. Smith ’70, Marianne Crosley ’80, P’16, and Peter Blaise Desnoes ’65, P’17. The Distinguished Teaching Award went to Lesleigh Cushing, Murray W. and Mildred K. Finard Associate Professor in Jewish studies, associate professor of religion, and director of Jewish studies; and Frank Frey (not pictured), associate professor of biology and environmental studies. Dr. Robert B. Raiber ’68, P’02 accepted the Humanitarian Award for his volunteer work in dentistry. Raiber played a significant role in identifying victims of 9/11. In addition, Raiber has traveled to the remote village of Hooper Bay, Alaska, to treat the villagers and was appointed to a task force to educate legislators and research solutions for the villagers to receive dental care. He has been recognized by a number of societies for his efforts. Emily H. Bradley ’10, Karl D. Fries ’10, and Safwan B. Shabab ’10 (not pictured) received the Ann Yao ’80 Memorial Young Alumni Award, which honors alumni who have demonstrated remarkable volunteerism during their first five years after graduation. The Maroon Citation honors alumni, employees, and friends of the university for their loyalty, commitment, and exemplary service to Colgate. Back row, L to R: Deborah Barnes (recently retired administrative assistant, president’s office), Dewey J. Awad II ’90, Harry E. Gould Jr. ’60, and Peter O. Hanson ’55, P’79,’86,’89. 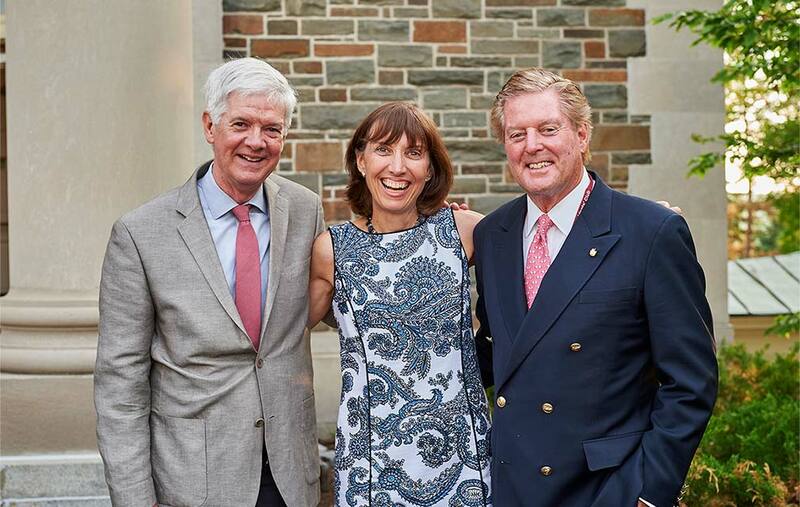 Middle, L to R: Heidi Bulow Parsont ’90, Dr. Mark A. Mandel ’60, and Peter L. Kellner ’65, P’87,’16,’19. 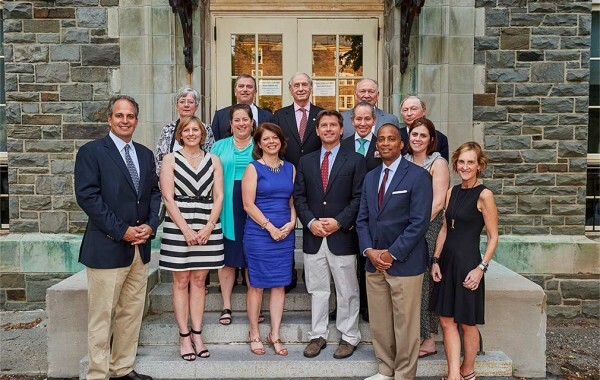 Front, L to R: Stephen J. Errico ’85, P’16, ’18; Christine LaFave (biology lab instructor), Lauren Galliker ’90, Thomas J. Murphy ’90, Leroy G. Potts Jr. ’85, Katie Finnegan ’05, and Lisa Oppenheim Schultz ’85, P’15,’18. Not pictured: Gregory J. Fleming ’85 and Joanna E. Allegretti ’05.